This page covers the author of March: Book One. For other authors named John Lewis, see the disambiguation page. 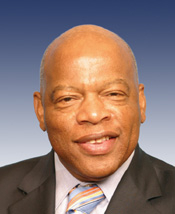 John Lewis has 2 media appearances. John Lewis discusses Walking with the Wind: A Memoir of the Movement. Congressman John Lewis visits the Houston Public Library to discuss his role in the historic Civil Rights Marches of the 1960s. Brazos Bookstore will be on-hand to sell copies of March: Book one and March: BOOK TWO. Tickets to attend the presentation are free with a reservation. Seating is limited. You can reserve your books to be signed from this page. Pay online with a credit card or at the event. Choose Pick Up In Store as your shipping option. Want signed books, but can't attend the event? Pre-purchase books before February 7. They will be signed are returned to the store for pickup on Feburary 9. The San Francisco Waldorf High School Lecture Series presents "A Champion for Civil Rights on the Continuing March for Equality" with Congressman John Lewis of Georgia and Congressional Aide Andrew Aydin, co-authors of March, the first book in a graphic novel trilogy which gives a vivid and powerful account of John Lewis' lifelong struggle for civil and human rights. Illustrated by Eisner Award-winner Nate Powell, and with a Starred Review by Publishers Weekly and Booklist, March is rooted in Lewis' personal story, and also reflects on the highs and lows of the broader civil rights movement. This conversation will be moderated by National Book Award-nominated historian Adam Hochschild, author of several works of non-fiction including To End All Wars and Bury the Chains. Click here to R.S.V.P. "John Lewis" is composed of at least 22 distinct authors, divided by their works. You can edit the division. John Lewis is composed of 5 names. You can examine and separate out names.